It’s a little known fact, but you can spawn some server-side processes from your Windows Azure Website. In fact, you can bring your own application and run that. Just add the .exe, and any dependencies, and start the process as shown in the first example. This is exactly how CGI works. So we can use Node as a CGI host for any application which compiles to Windows! Just replace NAME_OF_YOUR_APP.EXE with the name of your application, this executable should be included in your git repository (assuming you’re using git to push to Website!). It works! 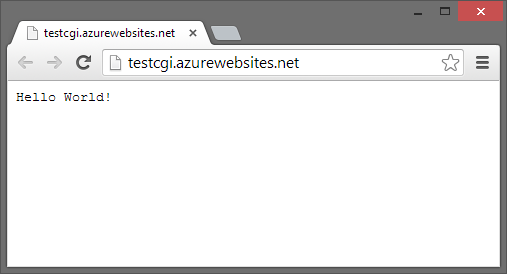 And shows that we can host CGI apps in Windows Azure Websites using languages outside the subset that have primary support on Azure. Ok, CGI is not the fastest piece of technology in the world, and web programming has moved on, but it could help people move legacy applications up to the Cloud.